I am Sunday’s child, a child of the sun. 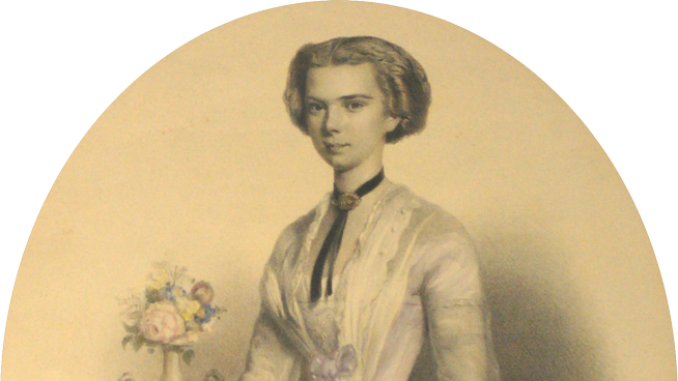 The future Empress Elisabeth of Austria was born on 24 December 1837 in the Herzog Max Palais in Munich as the daughter of Duke Maximilian Joseph in Bavaria and Princess Ludovika of Bavaria. The young Elisabeth grew up to be a child of nature; she excelled at horse riding, swimming, fishing and mountain climbing. She loved her Bavarian home of Possenhofen, the family’s summer residence and would have playdates with the children of the local peasantry. As of right now, Elisabeth stood in the shadow of her elder sister Helene, who was more beautiful and better educated. 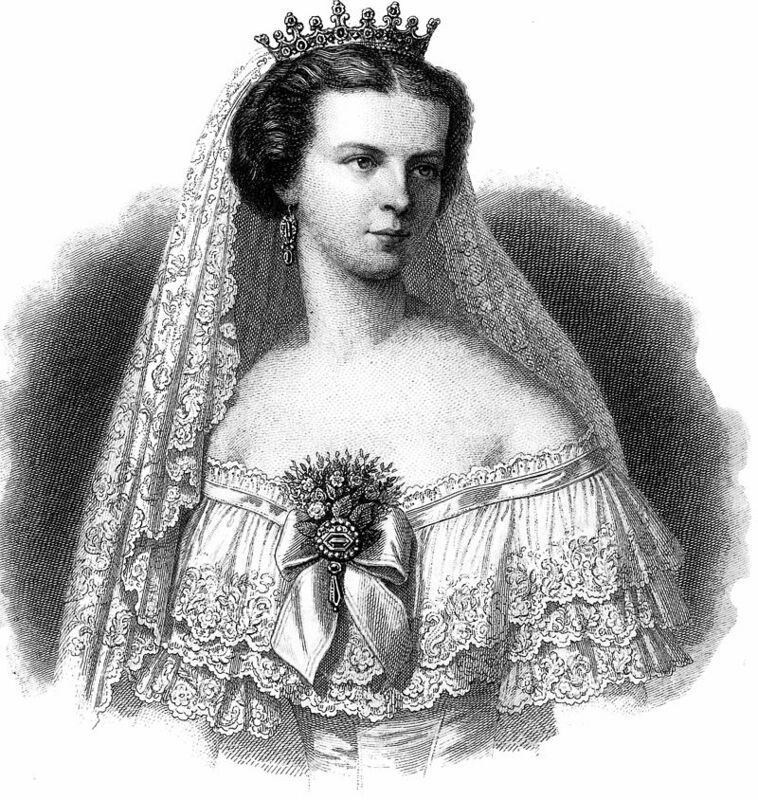 Helene was not for the second son of a King; she was to be Empress of Austria. 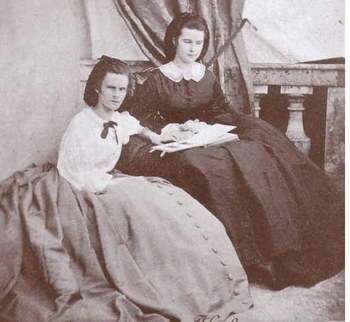 Well, that was the plan when Helene, her mother and Elisabeth set out for Bad Ischl in August of 1853. Elisabeth had recently had her heart broken after she had fallen in love with a mere count and the count was promptly sent away – dying not much later. Her mother hoped that the trip would lift her spirit and perhaps bring her closer to Franz Joseph’s younger brother Karl Ludwig, who was clearly already in love with her. The trip was delayed after Ludovika suffered a migraine and all her plans were thrown in disarray. The three women were dressed in mourning for an aunt, but the luggage with the lighter coloured dressed arrived after them, and so they were presented to the Emperor dressed in black. The following day, the day before Franz Joseph’s birthday, a ball was held in his honour. While Helene wore a splendid gown of white silk, Elisabeth wore a simple dress in pale pink. The Emperor danced the cotillion with Elisabeth and presented her with his nosegay. Everyone in the room knew that she was the future Empress, except Elisabeth herself. The next day, Franz Joseph asked his mother to make inquiries. When Elisabeth was told she said, “But how can he possibly think of me? After all, I am so unimportant!” She later added, “I love the Emperor so much! If only he were not the Emperor!” Her future position had begun to dawn on her. On 19 August, the Emperor and Elisabeth were alone for the very first time. 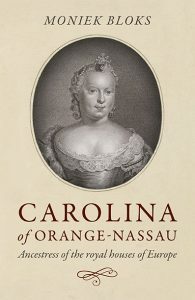 Ludovika wrote, “I left him alone with Sisi, since he wanted to speak to her himself, and when he came back to my room, he looked quite pleased, quite cheerful and she did too – as is proper for a happy bride.” The following days were very overwhelming for Elisabeth who was reportedly constantly in tears. Meanwhile, the forgotten sister Helene was unhappy and upset. She had received a cross of diamonds and turquoise from Sophie, but even this could not cheer her. Elisabeth would now need to learn French and Italian as quickly as possible, but most importantly, she had to learn about Austrian history. Her trousseau was to be assembled, and Sophie sent suggestions to the future Empress such as the advice that she should take better care of her teeth. Elisabeth was sent endless jewels and gifts from the Emperor, but she most appreciated the parrot he sent to her home in Bavaria. A month before the wedding, Elisabeth officially waived any claim to the succession in the Kingdom of Bavaria as she sat beside the King of Bavaria under a canopy in the throne room. Her bridal trousseau, consisting of 25 trunks, arrived in Vienna well ahead of time. On 20 April 1854, Elisabeth left Munich for Vienna. She shook hands with the servants, something she would not be allowed to do as Empress. A huge crowd had gathered around the Herzog Max Palais, and Elisabeth stood up in her carriage to wave to them with her handkerchief. The journey took three full days, and she boarded a steamer at Straubing. At Linz, she was surprised by Franz Joseph, and he left early in the morning to go ahead of her in order her to welcome her officially in Vienna. The final leg of the trip was on yet another steamer, the Franz Joseph. Elisabeth’s cabin was decorated with crimson velvet, while the deck was transformed into a garden. Upon arrival, Franz Joseph bounded onto the boat before it had properly docked to welcome her. A coach procession then brought the Princess to Schönbrunn. If the journey wasn’t exhausted enough, Elisabeth was presented to all the Archdukes and Archduchesses, followed by a large banquet that evening.